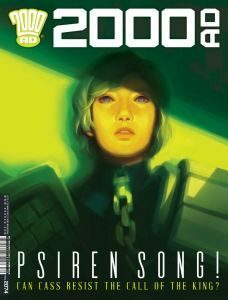 You are here: Home » MEDIA » Comics » 2000AD Prog 2074 (e-mag review). All new stories started in the last extra large issue of ‘2000AD’ and they continue in this one, though it’s back to the standard 32 pages. It’s hard to cope with more Thrill-Power than that every week anyway, so no complaints. It’s worth scanning the background summaries on page 2 of the magazine to get a clearer idea of what follows, especially if you’re not a regular reader. ‘Judge Dredd: Fit for Purpose’ (part two) has Judge Gerhart on trial by the SJS (internal affairs) for not being good enough at the job. After years of service, he is now seventy-five percent mechanical parts. Dredd, called as a witness, dislikes ‘psychopathic’ Judge Pin, who’s in charge of the hearing. There’s a neat use of silent panels for pacing and the ending hints of more trouble to come between Dredd and the Judge hierarchy. Last week’s opening episode of ‘Jaegir’ was all-action and there’s enough of it in part two as well. Kapiten Jaegir and Korporal Heize Klash (sorry, clash) with a Souther mobile Fortress. There’s also some talk about Jaegir’s dad being out of favour, so life may be harder henceforth. This also hints at a deeper plot to come. ‘Sinister Dexter: Night Class’ has Sinister teaching a class the noble art of gun-sharkery. He covers how to disguise your real gun as a toy and dealing with grenades, useful stuff for Americans, no doubt. This is okay but doesn’t compare to last week’s ‘Pulp Fiction’ spoof. I was a trifle confused by ‘Anderson: Psi Division: Undertow’ (part two) because some spooky character leapt out in one panel with no explanation of who he was or what he was doing. Going by the speech balloon, he looks to be a pal of Judge Death. Anderson seems set on enlisting the aid of a dangerous female in custody called Echo. Folly. Hasn’t she seen ‘Silence Of The Lambs’? ‘Strontium Dog: The Son’ (part two) continues the tale of Johnny Alpha on a mission with Kenton the son of Wulf Sternhammer, his former comrade. I’m sure there’s some movie with this theme of old hand and rookie son of his dead mate but I can’t think which one. The mission looks interesting and I’ve figured out why I prefer Carlos Ezquerra’s art in colour. It’s easier to separate objects and people one from the other and makes it a more pleasant read. I’m sure all the other artists must curse Ezquerra regularly whenever they have to draw that mad judge costume he designed for Dredd and the others. This issue has a letters page called ‘Input’, where every piece published earns you a free graphic novel. The necessity of this incentive seems odd to me because everyone nowadays shouts their opinions all over the Internet anyway. Why do you need a bribe to do it? On the other hand, it’s a good way to reward loyal fans. All the stories are progressing nicely and the art is excellent throughout this issue. I should also hail the good work of the colourists and letterers but how in the name of Artie Simek am I supposed to list every single contributor every review every week? Now that I’ve subscribed for a month I received a heads up email telling me there was more Thrill-Power available today. It also told me that the monthly subscription will continue automatically unless I cancel it, which I hadn’t realised. That’s common practice nowadays and in any case, I’m happy to continue for a while. It’s quite good really. The other new Judge Dredd film. « The House with a Clock in Its Walls (YA fantasy movie trailer).